Fluoride is a mineral that’s often found in food and municipal water. The valuable benefits that fluoride exposure has on a person’s oral health have been discussed for decades and are now generally supported by organizations like the U.S. Centers for Disease Control and Prevention (CDC). However, the amount you’re naturally exposed to in a day is usually very small. 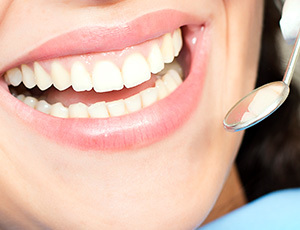 At Premier Dental Care, we can offer professional fluoride treatment as a part of routine appointments, supporting your healthy smile’s strength and longevity. How Does Professional Fluoride Treatment Work? Dr. Bakhtyari uses topical fluoride, which is applied directly to the teeth and then allowed to gradually seep into the outer enamel. This will strengthen your enamel and help reduce your risk of decay. You can also find topical fluoride in countless oral hygiene products, such as mouthwashes, toothpastes, and oral gels. While fluoride can benefit patients of all ages, we strongly recommend that children in particular receive applications every six months above all else. Our team may also recommend the use of systemic fluoride drops for infants or tablets for children up to age 13. It’s important to remember that too much exposure to fluoride may result in a condition known as fluorosis, which creates white spots on the teeth. Also, fluoride treatments used alone will not prevent cavities. Please also make sure that you and your loved ones are brushing twice a day, flossing at least once, eating balanced meals that contain a low amount of sugar, and attending two checkups and cleanings a year here at our Oak Hill, VA office.